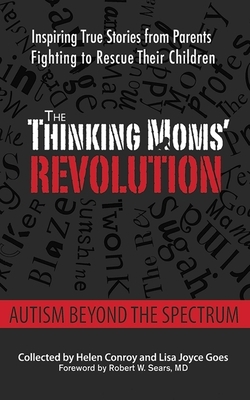 The Thinking Moms’ Revolution (TMR) is a group of twenty-three moms (and one awesome dad) from Montana to Malaysia who all have children with developmental disabilities. Initially collaborating online about therapies, biomedical intervention, alternative medicine, special diets, and doctors on the cutting edge of treatment approaches to an array of chronic and developmental disabilities, such as autism, sensory processing disorders, food allergies, ADHD, asthma, and seizures, they've come together into something far more substantial. Suspecting that some of the main causes may be overused medicines, vaccinations, environmental toxins, and processed foods, they began a mission to help reverse the effects. In the process, they became a tight-knit family dedicated to helping their kids shed their diagnoses. Here, collected by Helen Conroy and Lisa Joyce Goes, are the stories of their fights to recover their kids from autism and related disorders. With each chapter written by a different TMR member, they share how they discovered each other, what they learned from each other, and why it’s important to have close friends who understand what it's like to parent a child with special needs. You'll read about the their experiences, and learn how their determination and friendships have become a daily motivation for parents worldwide.